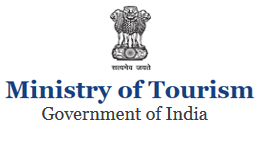 Adichchanallur (8° 37’ 47.6″ N; 77° 52’ 34.9″E) is located on the right bank of the Tambraparani River, in the Tuticorin District of Tamil Nadu. 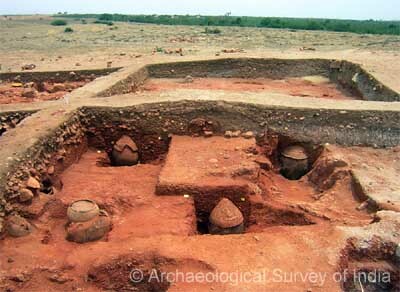 The extensive urn burial site at Adichchanallur in Tuticorin District (formerly Tirunelveli) was first discovered by Dr. Jagor of Berlin Museum in 1876. A. Rea excavated a good number of urns during 1910s and discovered gold diadems with parallels from Mycenae; bronze objects notably lids with exquisite finials depicting many animal forms, iron objects besides thousands of potsherds. 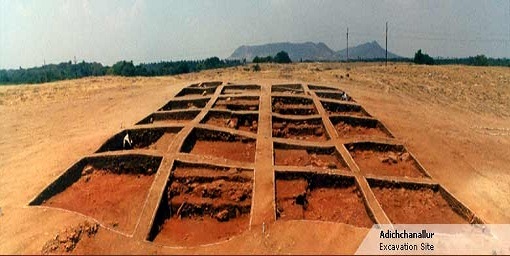 The excavation was resumed during 2003-04 and 2004-05. More than 160 urns within the area of 600 square meters have been exposed. The burials have been classified into three phases, viz., Phase I, II and III. 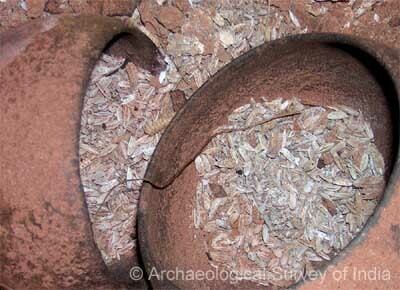 Phase I contains predominantly primary burials, while in Phases II & III, both primary and secondary burials are found. 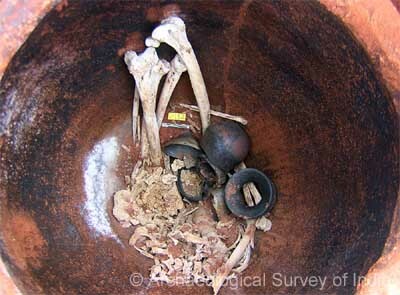 The skeletal remains inside the urns are invariably placed in crouched position. No orientation seems to have been followed. There are two examples of double burial. A potsherd with appliqué narrative scene is an important find. 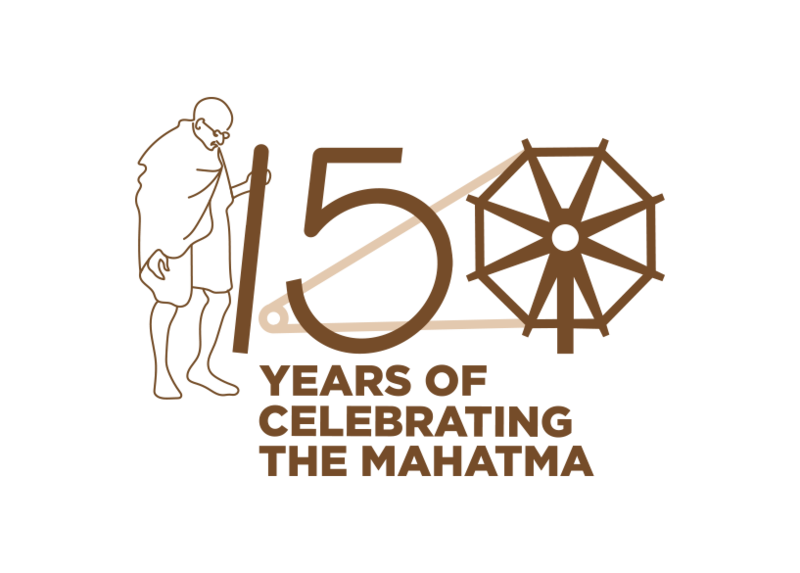 It depicts a slim and tall woman standing near by plantain tree. An egret is shown sitting on the tree and holding a fish. A deer and alligator are also depicted near the woman. Good number of graffiti on pottery has been discovered. Pottery types include black and red ware, red ware and black ware. The dominant shapes include bowls, dishes, vases etc. Some of the pots are painted in white. Iron implements like arrowheads, spearheads and axe are found, but eroded and badly preserved. 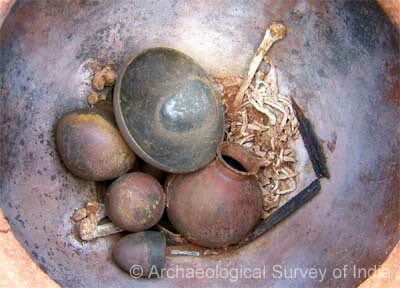 Few copper ornaments have also been found. Husk and cloth impression has been found on one of the Iron sword. 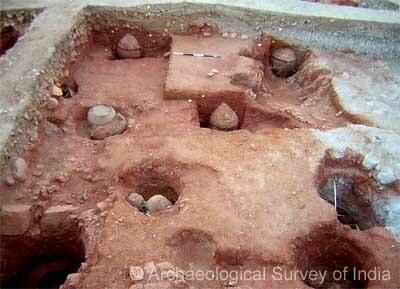 A potter’s kiln was also exposed in the habitational site.